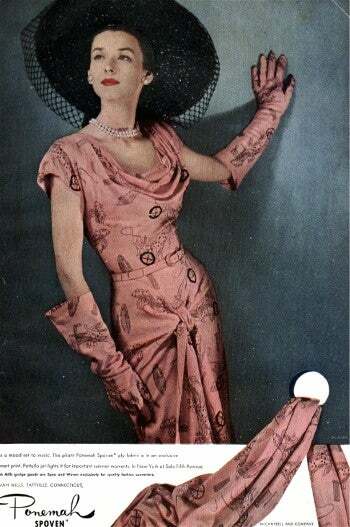 In the '40s and '50s Charm was a fashion and beauty magazine geared to the career girl. It was eventually bought out by Glamour in 1959. Since it's April, and this issue is from April 1947, let's take a look! In my previous post about Charm, I mentioned it was a magazine that catered to working girls and it was the first of its kind. Three very talented women, Estelle Rubenstein, as promotion director, Helen Valentine, editor, and Cipe Pinelles, art director, launched Charm Magazine because they realized there was no other publication at that time that spoke to the increasing numbers of women entering the workforce. According to this article covering Estelle Rubenstein's career in publishing, she was quite the marketing genius. Her worked has actually been archived by the Smithsonian Institute's Center for Advertising History. Below are more ads from the April 47 issue of Charm for merchandise in a style and price range that would appeal to this growing demographic. This ad for "Pirate Earrings" by Coro states they are "lovely loot for your ears." They're all priced from 2.00-3.00 a pair. Here's an ad for some rhinestone studded gun jewelry. Perfect accessory for the pistol packing "Girl Friday". The chatelaine was $5.00. Matching earrings $2.00. After a long, stressful week at the office fending off advances from the boss, while being paid about half of what a man earned, a working girl could relax on the weekend in one of these adorable playsuits with matching overskirt for only $12.00. And last, but not least, the shoes. These fabulous spectators were available in white suede with either brown, red, green or blue calfskin. I would have to have a pair in every color! This ad for "American Girl" shoes states of their customer, "she has a job, a home and community life." This post originally appeared on the website Blue Velvet Vintage. Republished with permission.